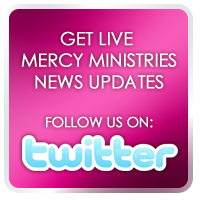 Mercy Ministries News: Event Filled Weekend in St. Louis! Last weekend, 32 runners participated in the Lewis and Clark Marathon in St. Louis on behalf of Mercy Ministries. This year, close to $15,000 was raised, which will continue to help transform the lives of girls seeking freedom! That same weekend, Nancy was the invited guest speaker at Family Faith Church. She had the privilege of leading all three Sunday morning services and delivered a powerful message from her teaching, “Keys to Walking and Living in Freedom”. The night before the marathon, the St. Louis girls and staff hosted a pasta party to kick-off the event. Runners, staff and residents enjoyed food and fellowship with one another. Nancy spoke and 3 graduates shared their testimonies of freedom with the group. The weekend events were a success! We’d like to thank the runners for their commitment to this marathon. Your dedication contributes to our ongoing efforts to reach more hurting young women. A special thanks to Pastors Rick and Marjie Hufton and Faith Family Church for their faithful ongoing support of the work of Mercy Ministries! Click here to view our video blog posting from this weekend.